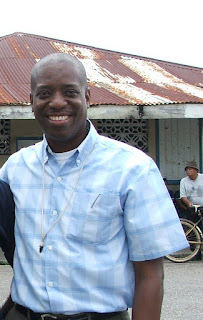 Ludwig Palacio is a well-known member of the Garifuna community of Belize. Born in Punta Gorda 46 years ago, he is the second child of Rose and Augustus Palacio. Ludwig was a mischievous, fun-loving, inquisitive child who excelled at everything he did. After graduating from Belmopan Comprehensive School in 1983, he earned a scholarship to study veterinary medicine in Cuba. After completing his studies in 1989 he returned to Punta Gorda where he has been a practicing vet for the past 20 years. Undoubtedly, Ludwig is one of the most talented persons I know. He is a published Author, whose writings have been well received. He has been writing prose, poetry, plays and skits since he was a teenager. A few of his published works include Sugarosi; A Collection of Prose and Poetry and Short Stories and the poem Mi Tierra Es Linda. He has also written the screenplay for the movie Agada, a story of a strong, resourceful and assertive Garifuna woman. I have no doubt it will soon be coming to a theatre near you. In embracing his self taught artistic side, he is able to coax beautiful art from everyday objects that surround him. It’s no big deal for him to fashion a table, a chair or a bench from bamboo, wood or any object that fascinates him. His repertoire also includes abstract art which he uses to express love, unity and environmental awareness. He is also a believer that technology can be inexpensively adopted to fill the need at hand. To that end, he has invented and produced wood-burning stoves, solar food dehydrators and biogas digesters to name a few. One of his stoves is currently in the Garifuna Temple in Barranco and is used to prepare the food for the traditional Garifuna ceremonies. It is made of a rice hull and cement mixture and can be use to cook, bake and grill. His other invention is a biogas digester that captures the gases that are a by-product of the decomposition of pig manure and uses it as fuel that can be used for cooking. In addition to his creative and veterinary side, he is a consultant with responsibilities of strategic planning, business planning, social impact assessments, etc. This work required some travel and has taken him to places far and wide, including Thailand, the Caribbean, Guyana, Central America and the US. Despite the fact that he crams so much into a day, he still makes time to lend a helping hand to those individuals or businesses in the community that need him. Ludwig would not and could not be the man he is without the family that supports him in all his undertakings. Curlette, his wife, and their children Yserri, Ludwig Jr. Tanigi-Rose, and Vijay Ygemerri provide the stable family life that nourishes his soul and inspires him to face the challenges of the outside world. They are the center of his universe and because of them he is able to do as he does. Together, he and Curlette own and manage several apartments and are currently working on a farm house in which they intend to live sometime later this year. I’m sure at the farm there will always be a few of Ludwig’s “projects” in progress. I am very proud and happy to designate Ludwig Palacio as the second person for Belizean Spotlight of the Month. The spotlight is very well placed on Mr. Palacio. He is a role model to our Belizian children and community.